Thanks to Jason, Luke and Brandon for giving up their Sunday to work in frigid temperatures to repair a broken water main for Carroll County Dental Associates. The ground was frozen to 15” deep and was like concrete. The frozen layer had to be broken up with a heavy duty jackhammer mounted on a Bobcat. Luke installed a temporary water connection on Monday morning so Carroll County Dental Associates could take care of their 100 or so patients they had scheduled and Jason could continue with the slow task of breaking up frozen dirt. Thanks guys! ARE YOU READY FOR THE IMPENDING COLD SNAP? A look at ACCUWEATHER this morning shows a prediction of subfreezing temperatures now until Saturday JANUARY 6. -When a leak occurs, TURN OFF YOUR WATER. Sounds simple but when a leak happens, panic ensues. Water is gushing. Books, furniture, pictures, and anything in the deluge are getting soaked. Soaked drywall is falling from the ceiling. This is a panic situation and often people just don’t think clearly. -RIGHT NOW, find your main water valve and make sure it works. Turn the valve off and open a faucet. Water may flow for a few seconds before it stops, but if your valve is working, the water will stop flowing. If your valve does not stop the water flow, it needs to be replaced. Better to know that now so you can get it replaced. Too late when you’re in the middle of a flood. -If you have a well, find the switch or circuit breaker that shuts off the pump. Sometimes a freeze-up occurs at the tank or in the pipe from the pump to the tank. This is all BEFORE your main water valve and shutting it off does nothing in this situation. Turning off the electric to your pump will stop the flow of water…eventually. Any water remaining in your well water tank will empty after the pump is turned off. A restoration company (such as ServPro) to get started on clean up. Keep this in mind: If your pipes are frozen, many others have frozen pipes too. Restoration companies operate on a first come, first served basis. Don’t dilly dally, you want to get on their list ASAP. Call your Homeowners Insurance and file a claim. DON’T CALL YOUR INSURANCE AGENT. She/he cannot file a claim. They can give you the phone number to call. However, if this happens at night or during a holiday, you may not get a hold of your agent. THEREFORE, find that phone number to file a claim NOW. Again, first come, first served. If you cannot find your main water valve, give us a call. We can help you with that! 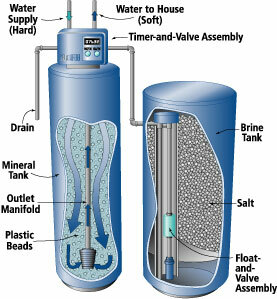 As we wrote in a previous blog, water softeners use salt to create a brine. That brine rinses off the hardness (calcium) from the resin inside the softener. It then recharges it with more sodium to continue removing hardness from the water. So, let’s look at the salt needed to complete this act. Now, there are two different types of salt- solar salt (left) and pellet salt (below)- that can both be entered into the brine tank of a water softener. Solar salt looks likes the salt that used to de-ice roads, or just much larger versions of grains of table salt. Pellet salt looks like packaging peanuts. Both are still salt so they both create the same effective brine mixture to rinse off the resin. But, as professionals, we recommend using solar salt- not because it is better but because of an unfortunate occurrence that is all too common with pellets. One thing about solar salt is that it is smooth in texture and dissolves into water through erosion. Pellets, on the other hand, are porous and the dissolving process is a lot more like melting than erosion. The pellets get soaked by the water in the brine tank and soften before they dissolve. When the brine water is removed from the tank the pellets harden and meld together. This is where it becomes a problem. Brine tanks always fill to the same water level to create the brine mixture. The water dissolves the salt, and as it does the salt above falls down to the bottom of the tank. However, in some instances the water will touch just the very bottom of a layer of pellets and will then harden them together to form one long sheet of hardened salt (pictured below in example illustration). This can create what we call a bridge and prevent the pellets from falling into the water. Now the softener is being rinsed with just water and not brine so the resin stays full and the softener stops working. This is generally not caught by homeowners until they notice they haven’t used salt in 6 months and the result is that Apple has to break up and remove the harden pellets or just replace the entire brine tank. It doesn’t happen to every system using pellets, but for the unfortunate few it is a costly problem. One thing to note is that some pellets come premixed with an iron removal substance and solar salt does not. But for systems that need a low level iron removing agent you can add a product called “Iron Out” in addition to solar salt to your brine tank. For those on a low sodium diet, fear not, generally the amount of sodium added to your water is very low- generally less than 12.5 milligrams per 8 oz. glass of water; much lower than the Food and Drug Administration’s standard for “very low sodium”, which is less than 35mg of sodium per serving. 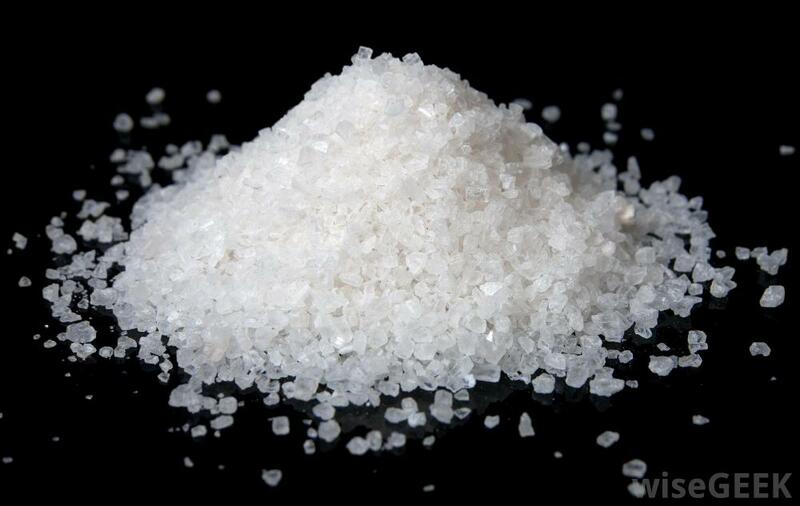 A “low sodium diet” according to the USDA is less than 1500mg/day, or 120 glasses of softened water! But if sodium is just a deal breaker, there is a company that makes pellets of potassium-chloride that can be used in place of salt. But beware, those pellets can bridge! Solar salt, potassium chloride, and iron out can all be purchased from us here at Apple. The last two blogs have been devoted to hard water and water with high iron content. Both problems have something in common, and that is how they can be resolved. Both hardness and iron are media that need to be removed from your water, and the way that is done is via a water softener.What is a Water Softener? Basically, softeners utilize two tanks and operate using an ion exchange system. The ion replacement takes place in one tank filled with small polystyrene beads, or resin. The beads are negatively charged and are bonded to positively charged sodium ions. As the water flows past the beads, the sodium ions swap places with the calcium and magnesium ions, which carry a stronger positive charge. In the other tank is salt. After several cycles, calcium and magnesium replace all of the sodium in the beads. When this happens the unit can no longer soften water. To solve this, the softener enters a regeneration cycle during which it soaks the beads in a mixture of water and salt (sodium chloride). The large amount of sodium in the brine causes the calcium, magnesium, and iron ions in the beads to give way and the beads are then recharged with sodium. After this regeneration, the softener flushes the remaining brine as well as the calcium and magnesium down through a drainpipe. For those on a low sodium diet concerned with the amount of salt your water is flowing through, generally the amount of salt added to your water is very low- generally less than 12.5 milligrams per 8 oz. glass of water; much lower than the Drug and Food Administration’s standard for “very low sodium”, which is less than 35mg of sodium per serving. A “low sodium diet” according to the USDA is less than 1500mg/day, or 120 glasses of softened water! But if sodium is just a deal breaker, there is a company that makes pellets of potassium-chloride that can be used in place of salt. Standard Water Softener vs. Iron Water Softener. Although we use the same water softening equipment to remove both hardness and iron, there is a slight difference between a system meant to remove just hardness and one meant to remove hardness and iron. An Iron Water Softener uses a smaller, finer resin bead than a standard water softener. This finer resin allows the softener to remove a higher level of iron than the standard resin. A standard softener should only remove a small level of iron whereas the finer resin can remove up to 10ppm of iron. Why not just use the finer resin in all softeners? Simply, it is more expensive, so let’s not spend our hard earned money unless it is necessary! Advances in Technology A traditional water softener has a time clock head that determines when to rinse off the resin with the brine solution. Basically, a technician takes the level of hardness, asks the homeowner about water usage details, and then makes a calculated guess as to when the softener needs to enter rinse mode because the resin can no longer soften the water. But thanks to modern technology, we now have what we call metered heads. New softener heads have a meter that measures how many gallons of water have been used during the current cycle. The head is digitally programmed with the hardness level of the water and actually calculates when the resin is full. Once the resin is full the system enters the rinse mode. This saves energy, salt, and water! And that is everything you wanted (or didn’t want) to know about water softeners! Have questions about the iron content in your water? We've got answers! Q. What exactly is the iron in my water? A. Iron comes in two forms, ferrous and ferric. Ferrous means the iron is dissolved into the water so that the water contains iron but still appears clear. Ferric iron results when ferrous iron has been exposed to oxygen and oxidizes, which causes the iron to then separate from the water and become a suspended matter, much like sediment. Q. How is it measured? A. Both ferrous and ferric iron is measured in parts per million, or PPM. The industry standard is that iron levels of over 0.2 ppm in a water system should be addressed and treated. Q. How does it get into our water? A. As iron is found in deposits in the ground, water readily dissolves it as it passes through them in its underground flow into our water sources. It can also result from the corrosion of pipes and your various plumbing systems. Q. What can iron do to a home and plumbing system? A. In the home, both ferrous and ferric iron show themselves by leaving hard-to-remove yellow or reddish-brown stains on fixtures, anything porcelain and cooking utensils. They can also leave similar stains on clothing in the laundry. Water high in iron also has that distinctive metallic taste to it. To your plumbing system, ferric iron acts similar to sediment/hardness and can contribute to the formation of clogs in pipes, wells and pumps among other systems. Q. How are high iron levels reduced from water? A. Stay tuned to see the answer to this, and last week’s question on removing hardness from water in next week’s blog! That’s a good question. Simply, the hardness of water refers to the level of dissolved minerals, most commonly calcium or magnesium, found in the water. These minerals are the result of your water passing through limestone deposits in the ground before the water makes its way into your water system and eventually out your faucets. The more limestone between ground level and the water supply, the higher the hardness levels will be. Though city water can be hard, hardness is especially present in well water, where water falls to the earth and filters through the surface down to aquifers or the water table from which well pumps draw water. Water hardness is generally measured in grains per gallon (gpg). GPG refers to, just as it sounds, the number of grains of a given substance in one gallon of water. One grain is equal to 1/7000 lb. and one gallon of water equals 8.33 lbs. The guideline typically used for measuring hardness levels in residential water is as follows; 0.0-0.9 gpg=soft water, 1.0-3.9 gpg= slightly hard water, 4.0-7.0= moderately hard water, and 7.1-12.0 gpg= hard water. A level of over 12.0 gpg is considered very hard water. One thing to keep in mind is that having hard water is NOT dangerous or detrimental in any way to your health. It can and does, however, cause problems both to your plumbing system and in your home. Hard water reacts to soaps and detergents and forms a “scum” rather than allowing the soap to lather and do its job. This presents a problem when doing laundry, cleaning the house, and yes, cleaning yourself. It can cause clothing colors to dull and white fabric to appear yellow or grey, shortens the life of fabrics in general, causes soap scum rings in your bathtub, streaks glassware and dishes and prevents the soap and shampoo you use from lathering up as well as they should when showering. On their own, each of these can seem like a minor nuisance. But put them all together and combine them with what hard water can do to your plumbing system and suddenly it’s not such a small problem! Hard water builds up and forms deposits that clog up your pipes. These deposits, of course, restrict the flow of your water and can corrode pipes, dishwashers and washing machines as well as the various pieces of plumbing equipment you have in your home. Maybe most importantly, hard water causes scale and sediment buildup in your water heater (as pictured in the second image) decreasing heating efficiency, gallon capacity, and the life expectancy of the water heater. If hard water is such a problem, how do we get rid of it? Stay tuned…! There are many different components of water quality. While acidity, bacteria and hardness are among the better known, inside the trade one of the key components to water quality is something called Total Dissolved Solids (TDS). TDS is the measurement of the combined amount of organic and inorganic matter contained in water and it is measured in parts per million (ppm). The key here is that the matter is dissolved, which means that the matter has become part of the water. TDS is like putting salt into water, as you add the salt it disappears into the water. Pure water would have a TDS of 0ppm. Typical well systems have a TDS anywhere from 50 to 940ppm (our office’s personal record). On average, our customers well water TDS is 150-250ppm. What makes up TDS in water is generally not known without a laboratory doing a very thorough test on a water sample. TDS can be anything from the chlorine/fluorine cities put into water to minerals dissolved into the water while it is underground to nitrates from fertilizer on wells that are near farms. It is really just a numeric amount of the overall “stuff” that has dissolved into your water. There are always exceptions to the rule, but generally you cannot conclude that a TDS of 500ppm is more of a concern than a TDS of 150ppm. It just depends on what has dissolved into the water to raise the TDS. But the TDS test does not tell us what has dissolved into the water, just how much. Figuring out if part of the TDS is harmful would need to be determined by a separate test, such as chlorine, bacteria, or hardness test. In the rare case your water is making you sick, a laboratory test would be needed. But those are all separate well water issues! So why are we talking about TDS if it doesn’t indicate harmful substances in your water? Water can only dissolve so much matter before it becomes “full”. Once water becomes “full” any additional matter added to it will not dissolve and just become suspended in the water. Add a tablespoon of salt to a cup of water and it will dissolve. Keep adding salt, however, and eventually the water will not be able to handle any more and the salt will just pile up on the bottom of the glass. The same thing can happen with well water when trying to treat it. Systems such as sediment filters and UV lights remove the “bad components” from the water. But systems such as acid neutralizers and carbon filters dissolve “good components” into water in order to eliminate (or neutralize) the “bad components”. We refer to these “good components” as a sacrificial media, meaning they become depleted as they treat the water. If water has too high a TDS, it becomes difficult to dissolve those good components into the water and special sacrificial media or equipment is needed. TDS is also used to figure out if certain equipment is working. Equipment such as reverse osmosis systems take out a very wide range of dissolved minerals/organic material in water to give homeowners nearly purified water. On these systems, if the treated water has a much lower TDS than the raw water, we know the equipment is working even if we don’t know what exactly it is removing. How high of a TDS is too high? Well that depends. Water has the ability to dissolve different levels of matter. For instance, water has trouble dissolving calcite (the standard media in a neutralizer) once the TDS is above 600ppm. Magnesium oxide is a much more potent (and expensive) media to add to a neutralizer but does not have a problem being absorbed by water, even with a TDS well over 600ppm. That is why treating water is so much fun! Every water quality test results in different factors that we must take into account when determining which equipment is right (or wrong) for a plumbing system. TDS may not be as damaging as acid, but if it is ignored it can certainly make water treatment equipment ineffective. Check back next week as we explore what a neutralizer is and how it works! Back in December we told you about NSF/ANSI Standard 61 Annex G (NSF 61-G) and how it goes into effect nationally on January 1 2014. NSF 61-G ensures that any plumbing product that delivers drinkable water is limited to ≤ 0.25% weighted average lead content. The state of Maryland however, has decided to enforce NSF 61-G two years in advance and it went into effect on January 1 of this year. The most common items of concern for lead safety are brass and solder - copper, plastic, stainless steel and chrome are all lead-free. Concerned about lead in your home or business? Call us today at 410-840-8118. All of Apple Plumbing’s technicians have been trained on this new standard and can help you identify and rectify lead plumbing issues in your home or business.